1. What changes will be made to the lineup? If the Revolution’s last midweek clash (May 20 at Kansas City) was any indication, we may see a team that bears only a passing resemblance to the one that took the RFK Stadium pitch on Sunday. A team we may have eventually seen next Wednesday had, you know, the Revolution taken care of business against the Charlotte Independence (too soon?). But that’s neither here, nor there. Among the players whose names could be on the lineup sheet: Brad Knighton, Daigo Kobayashi, Kelyn Rowe, Diego Fagundez and Kevin Alston. And given that Wednesday’s game will be the third in eight days for the locals, we may see even more alterations, including a London Woodberry sighting at center back, or even a Donnie Smith appearance at left back. 2. If the Revolution score first, how can they do better to protect that lead? Two words: team defense. A concept easy to understand, but difficult to execute. In order for any team to pull it off, every player must stay true to their defensive responsibilities. That, of course, is the primary objective. Additionally, the coaching staff must do their jobs to not only prepare the players, but make the appropriate substitutions. As a we saw on Sunday, a poor substitution can make a situation go from bad to worse in a hurry. One more thing: the finishing must improve. Lee Nguyen, who’ll enter Wednesday’s match with a team-high 35 shots, has to improve his accuracy so the burden of protecting any lead gained doesn’t fall square on the shoulders of…well, whoever’s stationed in the defending third. 3. How can the Revolution cut down on the mental lapses? To avoid a sequel of Sunday’s collapse, the Revolution must improve its communication, especially under pressure. The backline and goalkeeper must stay in tune with each other to avoid goals like Chris Rolfe’s equalizer, circa Sunday. Whoever wears the armband must not be shy in chatting up his teammates. He must remind, and then remind some more, what those around him must do whenever possible. Discipline also goes a long way when it comes to cutting down on the brain cramps. It may be tempting to foul a creative player inside the box, but for goodness sake’s, don’t do it. It’s a trap. Then there’s the coaching staff, who have to ensure that each and every one of their players understands their roles before and during the match. It is their responsibility to prepare their players, both tactically and mentally. Lastly, the players have to put an end to playing tentatively late. After all, the mistake-avoidance mentality is a sure-fire way to watch success slip away. 4. Will Charlie Davies add to his account? 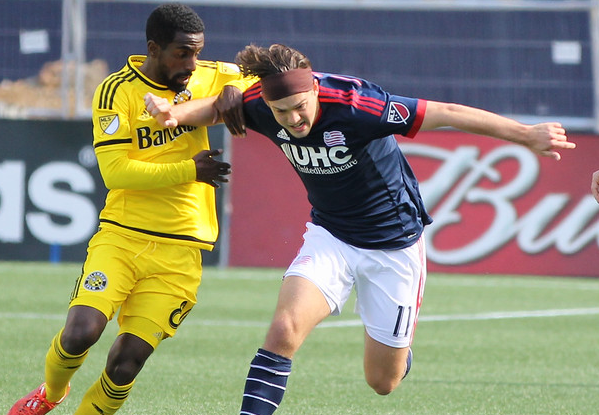 The last time we saw Davies at MAPFRE Stadium – ne’ Crew Stadium – he lit up the board for a brace in the Revolution’s 4-2 win during the first leg of the Conference semis. So spot the striker two goals for Wednesday. Right? Not so fast. Consider that Davies – who may not even start – will be coming off of only three days of rest in sweltering conditions. Also, there’s no Jermaine Jones this time around. That’s not to say the BC Eagle won’t find the back of the net. We’re just saying it won’t be easy. 5. Can the Revolution rebound from Sunday’s loss? Yes – and in fact, they should. Columbus is not nearly as strong a side as DC, nor do they have the kind of bench that United coach Ben Olsen had at his disposal. So that, in and of itself, is reason enough to believe that the Revolution can get a result. Also: it won’t feel like 100 degrees at kickoff this time around. Now, we’re not saying that the Revolution are going to put a four-spot on Columbus and coast to victory, mind you. A reprisal of last year’s first leg of the Conference semifinal probably isn’t going to unfold on Wednesday in the Buckeye State. But let’s just say that Gregg Berhalter’s team has a lot more in common with Frank Yallop’s side than Ben Olsen’s selection. And that, in and of itself, should give pause to even the most pessimistic Revolution supporter. What other question surround the Revolution heading into Wednesday’s contest in Columbus? Let us know in the comments section!